I’m an absolute, unapologetic sucker for films that provide the chance to be transported to original, fully-realized, tangible places, allowing me to virtually inhabit the cinematic world of the characters. 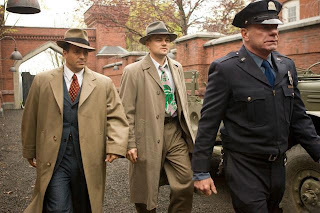 Martin Scorsese’s latest, the inconsistent-but-impressive psychological thriller Shutter Island, masterfully does just that, plunging the viewer into the eerily quiet Massachusets-situated Ashecliffe Hospital, a stone fortress-like psychiatric prison housing the most appalling criminally insane deviants mankind ever accidentally birthed. Concealed behind an impenetrable wall of fog, and located atop a craggy, rocky land mass so unsightly that there might as well be trolls peeking out from within its endless jagged crevices, the facility at once utterly repulses us while nonetheless drawing us into its nefarious clutches. 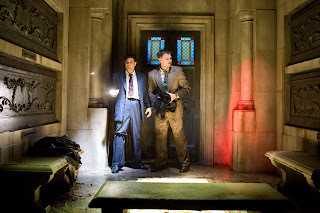 Such is also the unlucky case for Teddy Daniels (Leonardo DiCaprio, in perhaps his best performance with the director) and Chuck Aule (Mark Ruffalo), two U.S. Marshalls, circa 1954, assigned to uncover the truth behind the disappearance of one of the penitentiary’s deranged inhabitants. Naturally, upon warily entering the cast iron gates of Ashecliffe – an ominous episode given, courtesy of the relentlessly throbbing, doom-drenched soundtrack, all the nerve-racking fanfare of King Kong’s unforgettable emergence from the thick, suffocating jungles of Skull Island – and surrendering their weapons, the two lawmen quickly find themselves at odds with the hospital’s exceedingly calm medical director Dr. Cawley (Ben Kingsley – masking restrained menace behind a soothing, silky voice) and his German colleague Dr. Naehring (An effortlessly intimidating Max von Sydow). 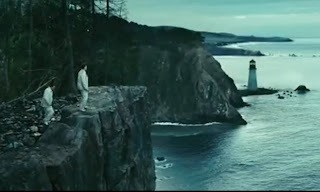 Finding their investigation hopelessly obstructed by Ashecliffe’s tough rules and regulations and its uncooperative staff and patients, Teddy begins to grow unhinged, plagued by visions of his recently murdered wife (Michelle Williams), as well as a traumatic WWII experience liberating a Nazi concentration camp. As the tormented lawman slowly loses his grip on reality, and a violent hurricane batters at the fortified walls outside, the two Marshalls slowly come to realize that sinister forces may be planning to ensure that they remain at the facility. Permanently. Ostensibly a glorified B-movie in A-movie trappings, Scorsese has nonetheless delivered a hauntingly gorgeous visual feast. Working with his regular cinematographer Robert Richardson - A current Oscar-nominee for his efforts on Inglourious Basterds – and Editor Thelma Schoonmaker, the celebrated auteur conjures up a number of audacious moments that leave you breathless. There’s a lengthy tracking shot, unsympathetically flo ating down a line of Nazi soldiers being executed, that is a thrilling feat of movie-making virtuosity, along with an alarming trip to the dreaded Ward C that feels like a descent into Hell and a nightmarish sequence involving a sea of rats that manages to out-creep both Indiana Jones and the Last Crusade and Werner Herzog’s Nosferatu. Even more startling are the many spellbinding flashback and hallucination sequences which, unlike throngs of similar genre entries, actually operate on a believable plane of fevered dream logic. In particular, the team puts Michelle Williams’ ethereal, porcelain-doll loveliness to magnificent use, creating an enthralling and disquieting aura around her. 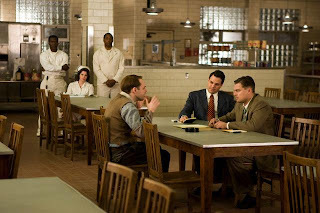 Alas, as exquisitely technically crafted as it frequently is, Shutter Island underwhelms in the story department. For the film to truly succeed it needs to completely draw us into Teddy’s psychological spiral and make us share his escalating sense of trepidation, uncertainty and anxiety. Unfortunately, Scorsese and screenwriter Laeta Kalogrodis never quite figure out how to transform Dennis Lehane’s novel into a wholly engrossing venture. 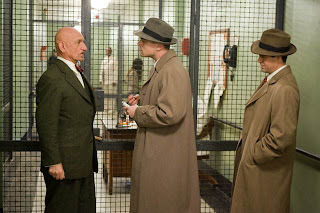 Although it starts off incredibly strong, the movie’s latter half is often cluttered and plodding, featuring far too many scenes of powerhouse character actors (including Jackie Earle Haley, Patricia Clarkson, Elias Koteas and Ted Levine) providing Teddy with draggy enigmatic exposition that is more frustrating than tantalizing. At 138 minutes, the film could use some serious trimming, especially in the concluding flashback which, while thematically important and beautifully staged, would have been significantly less harmful to the already-bumpy pace if dealt with in a briefer manner. 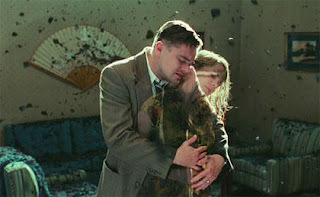 There’s also the issue of Shutter Island’s plot twist which is, frankly, both far too predictable and utterly ludicrous. Scorsese makes the wise decision to not smack us over the head with a sudden shocking transition, instead allowing for a subtle shift free of stylistic fireworks, but that doesn’t make it any less silly. It’s the sort of twist that requires one to make a leap of Grand Canyon-sized logical proportions to accept and, if scrutinized even minutely, causes the entire house of cards to collapse. 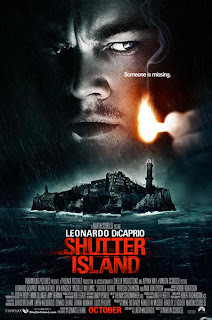 In the hands of a lesser talent, Shutter Island would probably be a disaster. Yet in Scorsese’s masterful hands, and filtered through a fully engaged cast, it’s an agreeable night at the movies with enough extraordinary imagery and chilling atmosphere to make it still a film undeniably worth seeing. I’m not likely to forget the dreary, fearsome Ashcliffe institution, with its shuffling bands of zombified inmates and interchangeable orderlies, any time soon. I just wish I felt as strongly about the tale unfolding within its cold, pitiless, lonely halls. *Originally printed in SFU's The Peak: March 1st.